Located on Elmwood Ave near the intersection of Greenbush St and Erie St, Extra Space Storage serves residents of Lafayette. Locals will recognize our facility in Market Square Shopping Center. Extra Space Storage is about 2.6 miles from Purdue University, providing an easily accessible option for college students in Lafayette who need summer storage or storage while studying abroad. 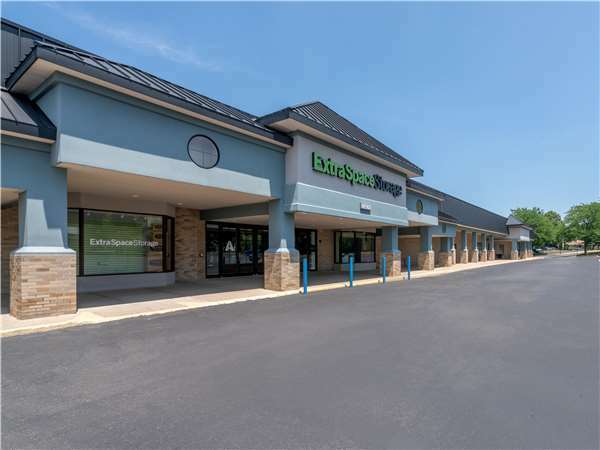 With a wide range of storage units, climate-controlled storage, and exceptional security, Extra Space Storage on Elmwood Ave is the self storage partner you can count on in Lafayette! Units at our Lafayette storage facility range from 5x5 to 10x15 and come with features like indoor access, first-floor access, and more. We can accommodate residential and commercial storage needs! To ensure the safety of our customers and their belongings, our Elmwood Ave storage facility utilizes security features like 24-hour video surveillance. Keep sensitive items safe from extreme heat and cold year-round in a climate-controlled unit! These units stay between 55? and 80? at all times, preventing damage to your belongings. Extra Space Storage cares about providing an incredible storage experience for each and every customer. From our clean, well-maintained, secure facility to our friendly, professional staff, we deliver high-quality self storage and excellent customer service. Contact us today to reserve a storage unit in Lafayette! The experience has been so fantastic! The manager there is so polite and goes above and beyond to help. The quality of the space, the security and access, and the customer service I received on a Saturday afternoon FAR exceeded my expectations. I'm still a fairly new customer, but I already have a strong loyalty. I just switched to this storage company from a company in West Lafayette. My first impressions are great. Jeryl, the manager, is super friendly, answered all of my questions, and put my mind at ease that my stuff was safe. The facility itself is clean, well lit, and doesn't have that nasty musty smell that a lot of them have. I like that the units are all on one floor, no stairs to climb with boxes. I like that there is a 24/7 line I can call if for some reason I would need access to my stuff after hours. I have high hopes for this facility. This was a very easy process. The facility is great and the manager is extremely friendly and professional. I highly recommomend! Staff is friendly and helpful. I love the security and the convience of having climate contolled storage. I would highly recommend this place. The staff is friendly, knowledgeable, and respects your time. The facility is clean and easy to access with great hours. The inside climate controlled building is great and they even have carts to use. We moved into a new office location which did not provide needed storage space. We researched several locations and chose Extra Space Storage due to location and the helpfulness of the staff. The staff was very helpful in answering our many questions and accommodating to our needs. Great customer service, clean, secure, affordable, and very accessible whenever I need to access my storage unit. I highly suggest this company for your storage needs. I have used many storage rentals and Extra Space is the best by far! I love the climate control and rental insurance! Great facility. Thorough review of services. Enthusiastic and helpful staff. Easy access. Carts available to move items to and from units. Great facility and great staff! We dreaded the task of moving our items and went into Extra Space just wanting to get it over with. Jeryl turned the move into a pleasurable experience with her great personality and professionalism. I recommend Extra Space to everyone. My experience at Extra Space Storage in Lafayette, IN has exceeded my expectations. Jeryl is professional and carefully explains each step promptly without delay. The customer service representative who helped me was extremely helpful, responsive, and friendly in getting the unit set up. I was in a rush and she understood and did not hold me up at all. I needed a few special requirements and she accommodated without hassle or issue. The storage area is very secure and clean. I needed to find a short-term storage unit to hold my things while I was preparing to move cross-country. I was able to get a great unit within my price range at Extra Space Storage. Everyone I spoke with was incredibly helpful and happy to answer all of my questions. Moving in was fast and easy. I would recommend Extra Space Storage to anyone looking for a storage unit. Highly recommend Extra Space Storage, Great Experience!! Very helpful to all our needs and concerns! Very clean and easy access to the units, can't say enough about the place!! Jaryl was awesome and got me in my unit quick and painlessly. We stored our daughter’s dorm room furnishings. We moved her things into an exceptionally clean unit, helped by a very friendly and capable staff. Good monthly prices without a long term commitment. Climate controlled, newer facility. Great customer service and easy access. Extra Space employees are the best! They were very friendly and I was blown away after getting a follow up call to make sure there was nothing else I needed! I can rest easy knowing my belongings are in great hands and with top of the line security in place! I put off moving my things for years, not realizing what I was missing with Extra Space Storage! Drive southeast on Sagamore Pkwy N. Turn right onto Schuyler Ave. Make an immediate left onto N 24th St. Turn left onto Underwood St. Turn right onto Erie St. Turn left onto Greenbush St. Turn right after Burger King into the shopping center. Our facility will be straight ahead. Drive north on Sagamore Pkwy N. Turn left onto Greenbush St. Turn left at Burger King into the shopping center. Our facility will be straight ahead. Drive west on Greenbush St. Pass Sagamore Pkwy N and continue west. Turn left at Burger King into the shopping center. Our facility will be straight ahead. Drive east on Greenbush St. Pass Linnwood Elementary School and continue east. Turn right after Burger King into the shopping center. Our facility will be straight ahead.